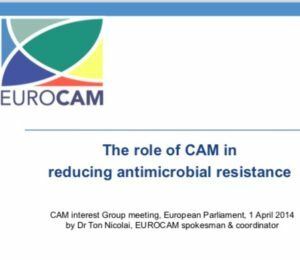 CAM: reducing the need for antibiotics was the title of the CAM Interest Group meeting that was held on 1 April 2014. It was hosted by Ms Sirpa Pietikäinen MEP (Finland) and Mr Alojz Peterle MEP (Slovenia). Antimicrobial resistance has been identified by WHO and the EU Commission as a major crisis facing the health systems of all countries. In the light of this crisis there is an urgent need to reduce the use of antibiotics. There is sufficient evidence that some CAM modalities offer effective treatment options for a range of human infectious diseases and can significantly reduce our dependency on antibiotics. In addition, they offer an effective alternative to antibiotic use in animal husbandry. They must therefore be seriously considered and investigated by the EU, for both human and animal health. Speakers from the CAM professional community and academia made presentations outlining CAM’s rich potential for the development of novel antimicrobial therapies that are not susceptible to developing microbial resistance. Ms Herta Adam, Deputy Head of Unit SANCO 3 - Health threats. Dr Ton Nicolai, EUROCAM spokesperson. Mr Michael McIntyre, Visiting Professor, Middlesex University, London, Chair European Herbal and Traditional Medicine Practitioner Association, UK. Dr Thomas Breitkreuz, President Federation of Anthroposophic Medical Associations (IVAA), Senior Consultant at the Paracelsus Hospital, Unterlengenhardt, Germany. Professor Dr Michael Frass, Professor of Medicine, Senior Intensivist, Department of Internal Medicine I, Medical University of Vienna, Austria. Professor Dr Johanna Fink-Gremmels, veterinarian, chair in veterinary pharmacology and toxicology at the Institute for Risk Assessment Sciences (IRAS), Utrecht University, the Netherlands. Ms Liesbeth Ellinger, veterinarian, researcher, Past-President International Association for Veterinary Homeopathy (IAVH), the Netherlands. More about antimicrobial resistance and the contribution of CAM.